Signals are a limited form of inter-process communication used in Unix, Unix-like, and other POSIX-compliant operating systems. A signal is an asynchronous notification sent to a process or to a specific thread within the same process in order to notify it of an event that occurred. SIGTERM is used to cause a program termination. It is a way to politely ask a program to terminate. The program can either handle this signal, clean up resources and then exit, or it can ignore the signal. SIGKILL is used to cause inmediate termination. Unlike SIGTERM it can't be handled or ignored by the process. Upstart: When stoping a service, by default it sends SIGTERM and waits 5 seconds, if the process is still running, it sends SIGKILL. supervisord: When stoping a service, by default it sends SIGTERM and waits 10 seconds, if the process is still running, it sends SIGKILL. runit: When stoping a service, by default it sends SIGTERM and waits 10 seconds, if the process is still running, it sends SIGKILL. Heroku dynos shutdown: as described in this link heroku send SIGTERM, waits the process to exit for 10 seconds and if the process is still running it sends SIGKILL. Docker: If you run your node app in a docker container, when running docker stop command the main process inside the container will receive SIGTERM, and after a grace period (10 seconds by default), SIGKILL. SIGTERM and SIGINT have default handlers on non-Windows platforms that resets the terminal mode before exiting with code 128 + signal number. 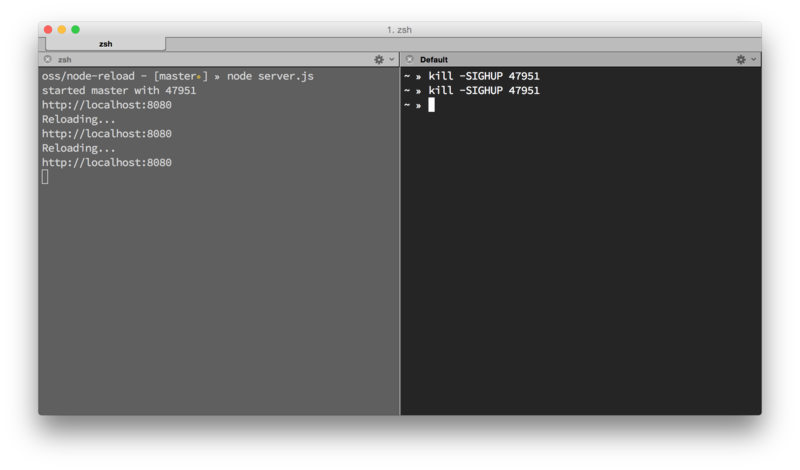 If one of these signals has a listener installed, its default behaviour will be removed (node will no longer exit). Fortunately, the http server has a close method that stops the server for receiving new connections and calls the callback once it finished handling all requests. This method comes from the NET module, so is pretty handy for any type of tcp connections. Some examples in blogs and stackoverflow uses a timeout on SIGTERM in the case that server.close takes longer than expected. As mentioned above this is unnecesary because every process manager will send a SIGKILL if the SIGTERM takes too much time. The obvious error here is that when doAnotherThing fails the callback is called once with the error, and once with result. However there is one special case that is very hard to reproduce and to discover, moreover it has happened to me several times. After some debugging I found out that it didn't hang only on expect but when we throw any error inside the callback. The intention of the developer with this try method is clear: to catch JSON.parse errors. But the problem is that it also catch errors thrown inside callback and execute the callback with a wrong error. Introducing these errors is very easy I've done several times, throubleshooting is very hard, so be careful and do not wrap callbacks call in try/catch blocks.